Demonstrating jointing an edge for passers-by during a break between classes. Photo by Cat Branam. The second day of The Furniture Project at the New England Home Show was quite a bit busier. I had one gentleman, Kevin Wilkinson, who had signed up for the whole day, and a couple of other people who signed up during the day. A number of people picked up cards and asked about the school and class schedules. For exhibitors at shows like this, woodworkers and others, it's all about the percentages. Engage a large number of people, some small percentage of whom will follow up. If 1 in 10 people who talked to me take a class, I'll have a good busy schedule this year. Kevin Wilkinson ripping a long strip from a board. Jim Parker practicing cross cuts. Connie Leathers resawing the long piece she had ripped from a board. I always have people rip a long strip off a board, because no one thinks they can do it, worrying about holding to a line. I have them practice taking it off course, then steering it back, like steering a car along a gently curving road. Connie said she has difficulty with accuracy. My response is that that there are operations that require accuracy, and those that don't. The ones that don't will be cleaned up in seconds with handplanes, using the saws and planes as a tag team. For the ones that do, there are steps that help ensure accuracy. The rest is practice to develop the control. My favorite analogy is learning to play a musical instrument. You don't play Beethoven right off. You practice to learn how to make notes, then how to combine them into music. In the meantime, you make a lot of mistakes, but throughout, your body is learning. 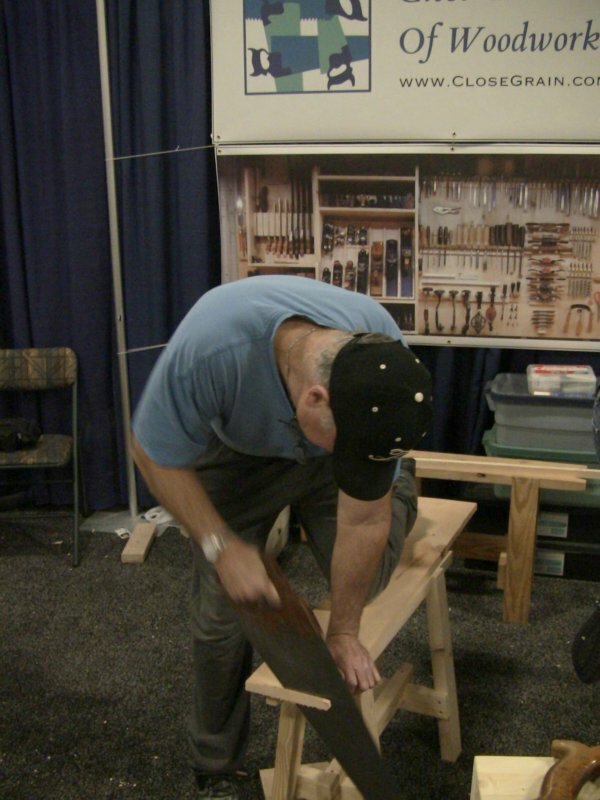 Since this is not a tool show, there aren't a lot of tool sellers. One opposite me on the aisle is the Micro Jig GRR-Ripper push block system, emphasizing safety even when ripping small thin strips for complex decorative laminations. 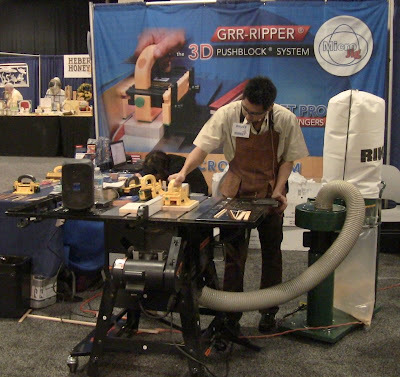 Bruce Wang demonstrating the GRR-Ripper on a SawStop table saw. There a number of independent and student exhibitors at The Furniture Project. The schools represented here are some of the ones I refer people to when they ask about more advanced classes than the ones I teach. 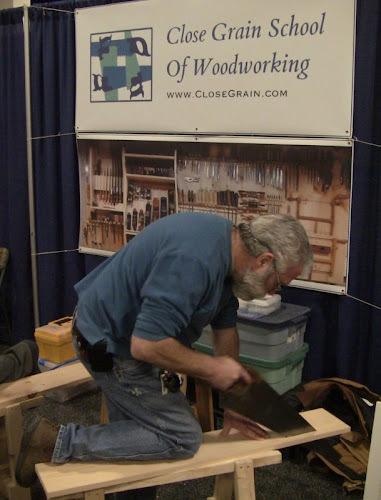 Ben Blackmar sharpening his chisels in preparation for dovetailing. Ben is a student at the North Bennet St. School, one of the finest schools in the country. 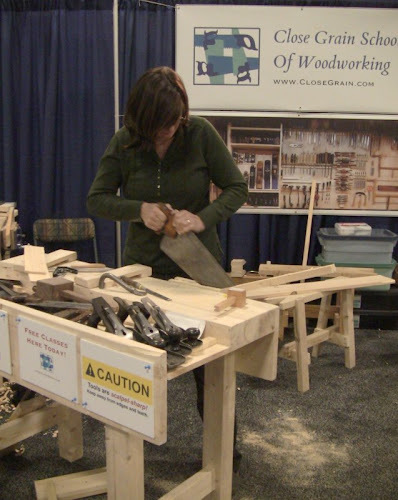 The school offers long-term and short programs and seminars in various forms of woodworking, jewelry making, bookbinding, locksmithing, and piano and violin making. 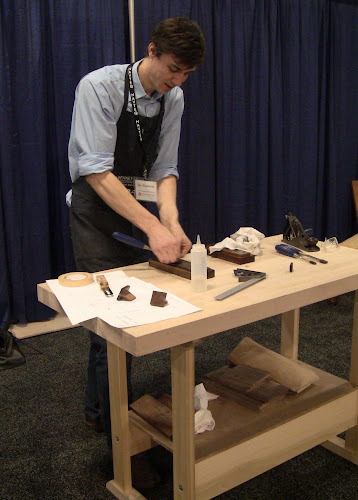 Zach Dillinger demonstrating hand-made window sash. Zach likes to build reproduction pieces that look like they're already a century or two old, following the aesthetic of the day. That means the dovetails look like they were sawed out by a cabinetmaker working for efficiency, not perfection. Many people are surprised to find that actual period furniture was not made with perfectly-fit joinery, even in the finest pieces. He has a lovely little William and Mary chest in the exhibition that looks like it's led a long life, but was built last year. 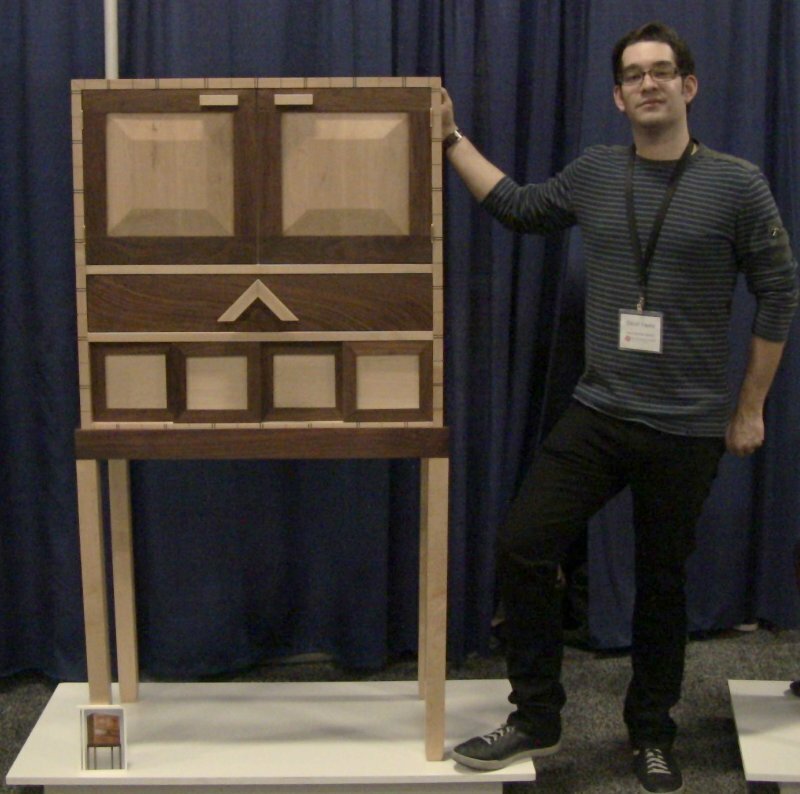 David Yepez with his whimsical cabinet-on-stand. 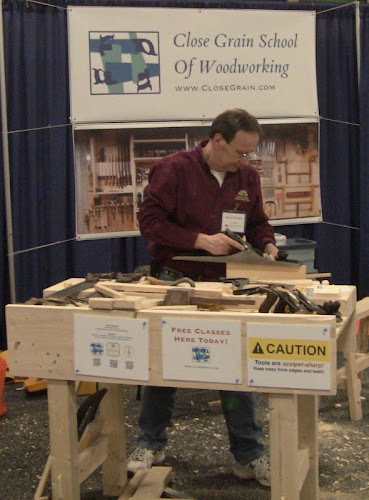 David introduced himself yesterday, saying he knew me from the Lie-Nielsen Hand Tool Event at Connecticut Valley School of Woodworking. He works for Lie-Nielsen as show staff and educator. 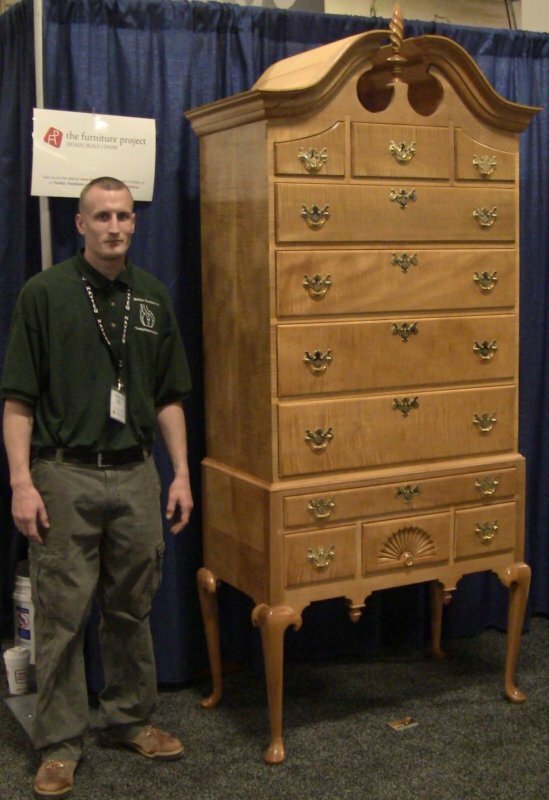 Steve Skillins with his magnificent high boy. 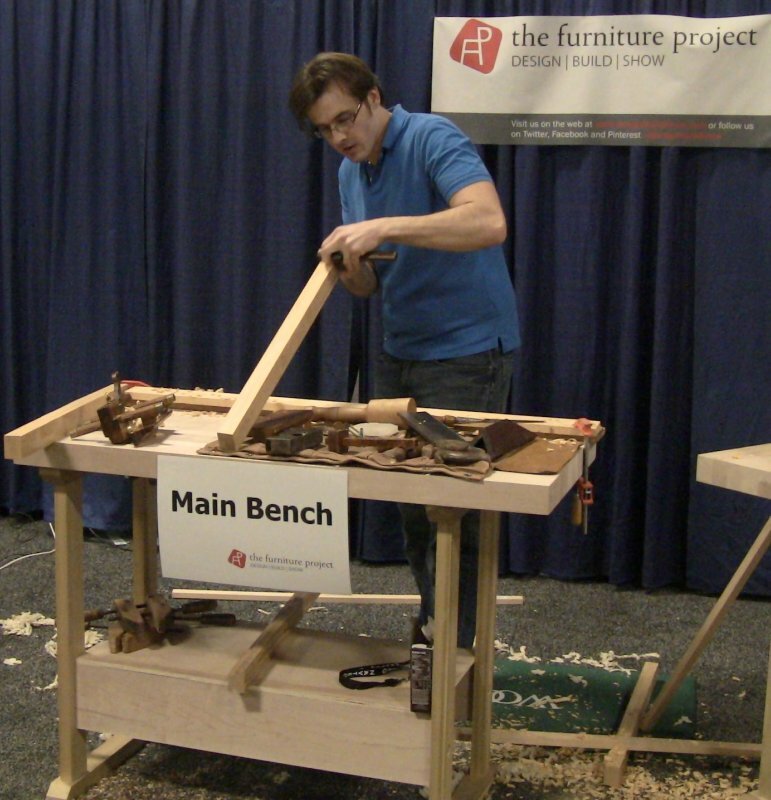 Steve is a student at Phil Lowe's Furniture Institute of Massachusetts. This is one of his school projects. Phil is one of my true woodworking heroes; he formerly ran the cabinet and furniture making program at North Bennet St. School. Thanks for having us. It was a lot of fun and very instructive.